As a whole I have really enjoyed this trilogy, but if I'm honest I have to admit that this final book, while enjoyable, didn't grip me the same way as the others and seemed just a little long. I still love all of the characters and watching their growth, but some of the magic was missing. I remember reading on another blog - sorry I don't remember which one - that the fact that the two main characters were apart for most of the book was disruptive to the romance, and I'm beginning to think that I agree, I think. Whatever the reason, I wasn't in any rush to finish Deliverance and just muddled my way through it. It's hard trying to analyse exactly what didn't work for me and as daft as this may sound, I think the fact that I read it electronically had something to do with it. Does anyone else have that problem? I'm finding that if I'm reading something on my Ipad, I find it much easier to just put it down and read a 'real' book, especially if it hasn't gripped me immediately. I know it's irrational, but there is something about having real pages in your hand and having a page already half-turned before you reach the end of it that adds to the excitement of a great book, and epub copies just don't have that! 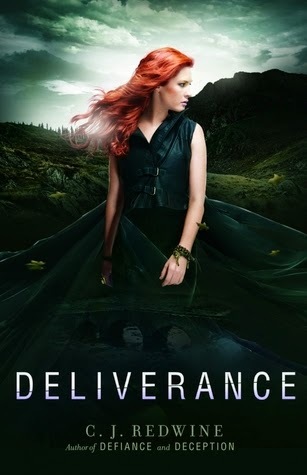 After all that, Deliverance was a fairly satisfactory conclusion to the trilogy and I would recommend it if you've enjoyed the previous two Defiance and Deception, but it didn't quite measure up to my expectations after Deception, which for me was the stand-out of the three.